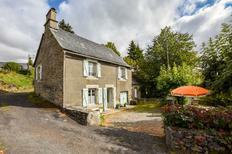 A holiday house in the Auvergne costs on average USD 556 in the cheap travel period and USD 849 in the peak season per week. These details are of course in relation to the house and not per person as well as includes the obligatory additional charges. Auvergne, in central France, is a historical region, characterized by mostly rural and mountainous landscapes, with several dormant volcanoes. The region is popular for skiing in the winter, and hiking the rest of the year. French students and visitors meet in the buzzing city of Clermont-Ferrand, which is also known for its great rugby team and Romanesque architecture. The region played a historical role during the underground resistance to the Nazi invasion in the second world war. 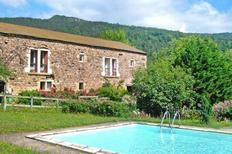 Families, groups of friends, and solo travellers will find suitable holiday homes in the Auvergne for a perfect vacation. When you choose to stay in a TUI Villas holiday home in the Auvergne, you can enjoy your time hiking the dormant volcanoes, visiting historical cities, or you can head to the volcano-themed amusement park. The region is well known for its mountain ranges and its 80 dormant volcanoes. The highest peak in the region is the Puy de Dôme, culminating at 1,465m. Different hiking paths, fitting for different levels of fitness will bring you to this scenic peak. All the volcanoes are extinct, so you needn't be afraid to hike up and admire the beautiful rounded craters, now covered in vegetation. If you are staying at an Auvergne holiday apartment in Clermont-Ferrand, the starting points for most hikes are about a 30min drive away. In the winter, the volcanoes are covered in snow and perfect for skiing. Finally, the acclaimed volcano-themed Vulcania Park is just a 30min drive away from Clermont-Ferrand. The region has a rich history which one can learn more about through the architecture of its larger cities, such as Clermont-Ferrand. This dynamic and buzzing university city is home to more than 37,000 students! One of the oldest cities in France, Clermont-Ferrand’s architecture is a beautiful blend of Roman, Medieval, and Industrial Age buildings. The city is surrounded by the industrial belt with the Michelin tyre factory, which as been a major source of income in the area for more than a century. The Michelin Museum in Clermont-Ferrand showcases the history of the company and its strong influence on the region’s economic development. 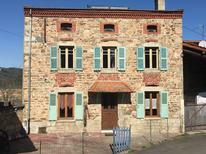 This is a great city to live with the locals and stay in an Auvergne holiday home. The locality of Salers is best known for the eponymous alcohol made from gentian roots and white wine, which was developed in the region. The bitter drink is usually served before a meal, along with small snacks, like nuts or crackers. But Salers is also known for its famous Cantal Cheese, a semi-hard, pressed, and uncooked cow milk cheese, renowned for its delicious taste. The easiest way to discover Salers and taste its delicious specialities is to reserve an Auvergne holiday apartment with TUI Villas. The hospitable local population will be happy to point out the main sights for you. Salers is not only a paradise for foodies, but also for animal lovers as the area is home to a rare Salers breed of cattle with distinctive long hair, and long horns. The Parc d’Attraction et Animalier is a theme-park combined with a zoo, located near the city of Saint-Pourçain-sur-Bresbre. With more than 25 attractions such as roller coasters, and more than 600 animals in semi-captivity, the park is the ideal place to spend a quality outdoor family day. Initially built with the support of the famous Vincennes Zoo in Paris, the park's initial role was to support Vincennes Zoo in rehabilitating injured animals. The park was turned into an amusement park in the 1980s, and developed a zoo in its own right. Less than an hour away from the theme park and zoo, you will find the volcano-themed Vulcania Park with plenty of educational and fun attractions. 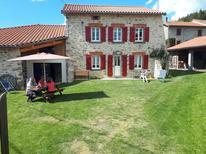 The area is an ideal spot to rent a holiday home in Auvergne with your family, close to nature and fun parks. Vichy is not only known for its crucial role during the second world war. It has also been famous as a fashionable spa resort town ever since the 19th century Belle Epoque. The city is home to multiple thermal baths, sourced from the nearby volcanic mountains. The Thermes des Domes built in 1903 is the most popular thermal bath facility to visit, offering the famous Vichy mineral-rich waters, which are believed to cure diseases. Each thermal bath facility has a speciality, so you can get a variety of spa treatments in the area, from hydrotherapy, to rheumatology and gynaecology treatments. 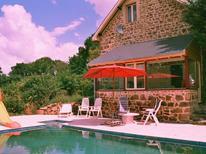 Stay in a holiday home in Auvergne in Vichy for easy access to all wellness facilities. 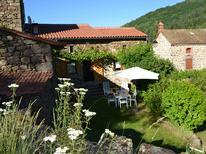 The Allier department in the north of Auvergne is home to wide valleys and green hills, ideal for hiking. The historical city of Vichy is the capital of Allier, and the whole region is known for its mineral water. When visiting the Auvergne, make sure to visit the Cantal department, home to the famous Cantal Cheese and the Salers Bitter aperitif. The central area of Auvergne with the famous city of Clermont-Ferrand is the Puy-de-Dome department, a region of Auvergne characterized by a volcanic, mountainous landscape, and charming holiday homes. Clermont-Ferrand is less than a 4 hours flight away from London, with several flights available every day. Travellers who prefer a road trip should expect the journey by car from London to Paris to take about 6 hours. It will then take approximately another 4 hours on the A77 or A10 to reach Clermont-Ferrand. A train trip will take you about 7 to 8 hours with the Eurostar from London to Paris, followed by a regional train to your final destination, Clermont-Ferrand. The climate in the Auvergne varies quite strongly, with warm summers and cold winters in the mountainous parts of the region, while the climate is more stable and mild throughout the year in cities like Clermont-Ferrand. Travellers who want to hike are recommended to visit in the autumn, spring, or summer season, while you should visit in the winter for skiing.